NXP is one of the major suppliers of ESD protection for USB3.x since 2009. In our experience, transceivers for USB3 are very sensitive to ESD pulses and need very low-clamping ESD-protection. For this reason, it was almost natural to integrate the latest generation of very low-clamping ESD protection, TrEOS protection into this “plug,” which can replace the CMF. Naturally, TrEOS protection is used in the integrated CMF as well. By having the choice of CMF with ESD-protection and ESD-protection-only in the same footprint, the first board design will be the final design — at least for the protection and filtering part. It is even possible to offer CMF to some markets and go without CMF for other markets, in the same platform, without a time-consuming re-design. The CMF option can even be added after the market launch. Fig. 1: NXP offers CMFs with ESD protection (left, PCMF-series) and ESD protection (right, PESD-series) in the same footprint to allow short-term changes between PCMF and PESD without board redesign. Fig. 2: S21dd is the ratio of the ingoing to the outgoing differential signal, in dependency of the frequency. The frequency, where the signal is attenuated by 3 dB, is the limit of the differential pass-band. The curves show the attenuation for a Ferrite-based CMF without ESD protection, and the same filter, when adding ESD protection having a pass-band of 14 GHz or 7 GHz. The 3dB frequency decreases from 6.3 GHz to 4.9 GHz or 4 GHz. When comparing the RF behaviour of CMFs, it is necessary to compare the complete performance. Fig. 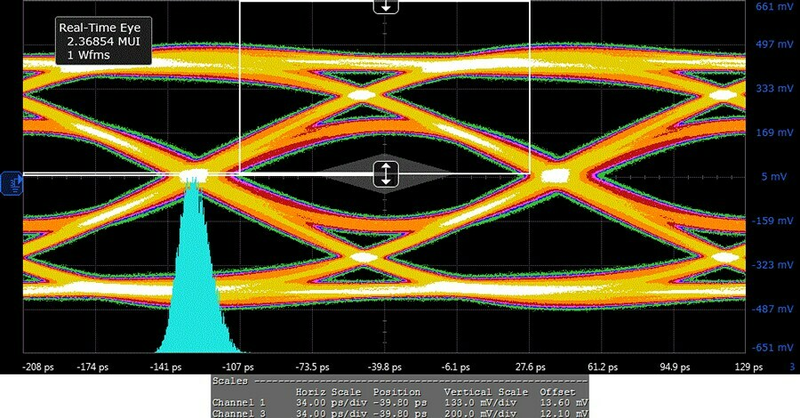 3: Differential pass-bands of an integrated CMF with ESD-Protection, PCMF3USB3S compared for the line pairs at pins 1-2 and 5-6. A high symmetry between line-pairs helps to avoid data skew. Fig. 4: Eye diagrams are overlays of all possible 1-0 and 0-1 signal transitions (left side). The mask (right side) must not be violated by any of these transitions to offer receivers the minimum acceptable signal integrity. Fig. 5: Comparing the USB3.1 eye diagram at 10 Gbit/s for PCMF2USB3S on a test board. PCMF2USB3S passed the USB3.1 compliance test at 10 Gbit/s on our test board in an external lab. Since data rates at these speed levels obviously needs careful RF design, NXP is able to share with you an example layout around the new USB Type-C connector. Fig. 7: Eye diagram of PCMF2HDMI2S on a test board with “worst cable emulator” (upper diagram) and additional skew at test-point 2 (TP2) and reference eye without Device Under Test (DUT) on a test board (lower diagram). Although the eye-diagrams look a bit unfamiliar, this is a very good “pass” result. The familiar eye diagrams at TP1 look very much nicer, obviously, and can be found in the data sheet of PCMFxHDMI2S. Fig. 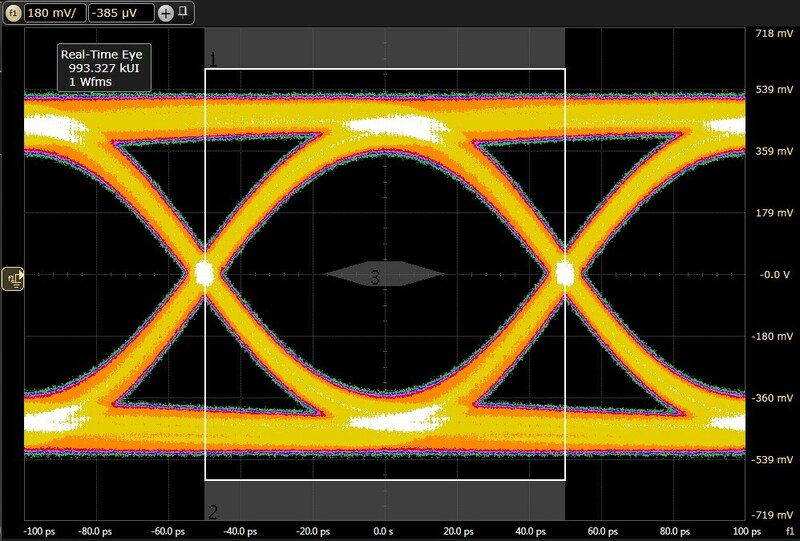 8: TDR (Time-Domain Reflectance) measurement of two integrated Common Mode Filters with ESD protection using a 200 ps filter (according to the HDMI standard). The impedance Z is measured over the running time (distance). The PCMF filter stays clearly inside the limits set by the HDMI standard, while the compared filter is too inductive to pass this test. Both filters are compared to the reference boards without filter (undisturbed transmission line). The time scales are different due to different board positions and device dimensions. Fig. 9: Comparing the common mode rejection of PCMFxUSB3S to the USB3.1 ferrite filter shown in Fig. 1. Since interference between the USB3.1 5 Gbps fundamental at 2.5 GHz with WiFi, Bluetooth and LTE-bands at 2.5 GHz needs to be avoided, a strong rejection in this frequency range is exceptionally important. The rejection of PCMFxUSB3S clearly exceeds -30 dB (less than 1/1000 in terms of common mode power) around 2.5 GHz and offers a rejection of more than one order of magnitude in terms of power between 700 MHz and 10 GHz, covering all GSM/3G/LTE/WiFi/GPS/Bluetooth frequencies with a broad-band common mode rejection. Looking at transceivers for very fast signals, like USB3.1, our experience is that the ESD survival level of the complete system is not defined by the ruggedness of the ESD protection device, but the clamping behaviour. In other words, how much remaining ESD is passed on by the ESD protection device? This is the case for all transceivers, which we have measured so far. Having said this, our PCMF/PESD series nevertheless offers a ruggedness against IEC 61000-4-2 ESD pulses of 15 kV contact, which exceeds the highest level 4 of this IEC-standard. PCMFxUSB3S and PCMFxHDMI2S as well as the PESDxUSB3S are all building on NXP’s TrEOS protection technology, which combines industry-leading switching speed (0.5 ns) with lowest dynamic resistances and a high robustness against 8/20 surge and ESD pulses. Fig. 10: comparing the TLP clamping of an integrated CMF with Silicon-based ESD-protection and a ferrite CMF with integrated ESD-protection. PCMFxUSB3S, PCMFxHDMI2S and PESDxUSB3S offer even lower clamping, however, this would be lost in the scale needed to display the TLP behaviour of ferrite-based ESD protection. Fig. 11: comparing the TLP clamping of the PCMF series to other CMFs with integrated ESD-protection.